March 1, 2017 March 1, 2017 Dr. R. A. Being cautious can be a good thing. However, sometimes we are too cautious which is detrimental. Being too cautious can lead to us being unadventurous and simply just missing great opportunities. Being too careful is driven by fear. Fear of what we perceive may be the outcome (usually and negative perception). Hesitation can cripple us and prevent us from achieving the great. Often excuses that we are too shy or not smart, strong or big enough is used to support our hesitant thoughts. We spend an enormous amount of time wondering what to do. If we are not careful, however, we may die while hesitating. Maybe not a literal death but our dreams and hopes may die while we continue to make up excuses and wonder which route to take. We often even ponder about when we should act, whether now or later. These moments of hesitation may lead to a lifetime of regrets and we will have no one but ourselves to blame. 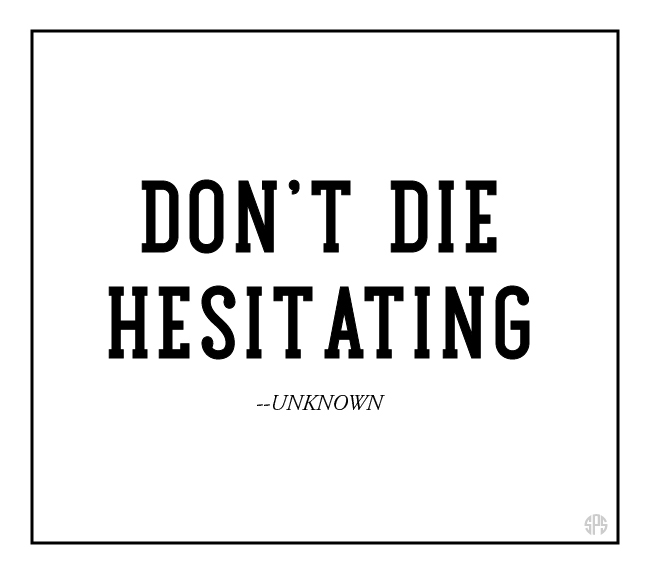 Therefore we need to stop hesitating!